Just a few minutes walk out of town (it's a small town, after all) gets me into a small wooded area by a stream in a park, where I find a huge stone crossing the stream -- an ancient bridge, next to a modern-ish wooden bridge. Nearby is a historical marker for what turns out to be the ancient Roman megalith. Well, of course: The Romans were everywhere in these parts. Though the English translation on the sign tells us the important fact that it appears to be the remnants of a Gallo-Roman camp sometime up to 300 AD, it leaves out the best bit in the original French sign which explains that there used to be two parallel stone megaliths bridging the stream -- which makes it a whole lot easier to cross with carts -- until the weight of a modern-day tractor driving over it collapsed the one side. Oops. As always, it begs the question: how on Earth did they move these stones and put them into place? Though it's not a raging stream, it's also not flat land. Nor was it ever likely to have been a major outpost. So it may be a small megalith, in a small town, of only small historical significance, but it's still a big mystery to me how they constructed it. Again I am reminded though of how much I love the depth of history here in France. For a New-Worlder, it's pretty amazing to find a 2,000 year old Roman ruin that is not a major historical site and sits largely ignored, just one of so many pieces of ancient history scattered -- or in this case laboriously placed -- across the countryside. It's not as colorful, and the known history isn't as complete, as the other story the gardener shares with me about the Rue Royale and its famous visitor, Louis XIII, in the 17th century. But just to put this in perspective, remember that when King Louis XIII was treading this road in 1622, well into the Renaissance period, the Roman megalith just a few minutes walk away was already ancient, forgotten history, over a thousand years old. Lingot de la Gâtine is a lovely, raw goats' milk cheese made by La Revalière Fromagerie, in the former Poitou-Charente region (now part of the larger Nouvelle-Aquitaine region) -- home to the best goat cheeses in the world, in my rather practiced opinion. And the six staff members at this tiny fromagerie create some of the best of the best, producing artisanal cheeses since 1981 from milk collected from three local farms, including Parthenay, Pictou, and Chabis. 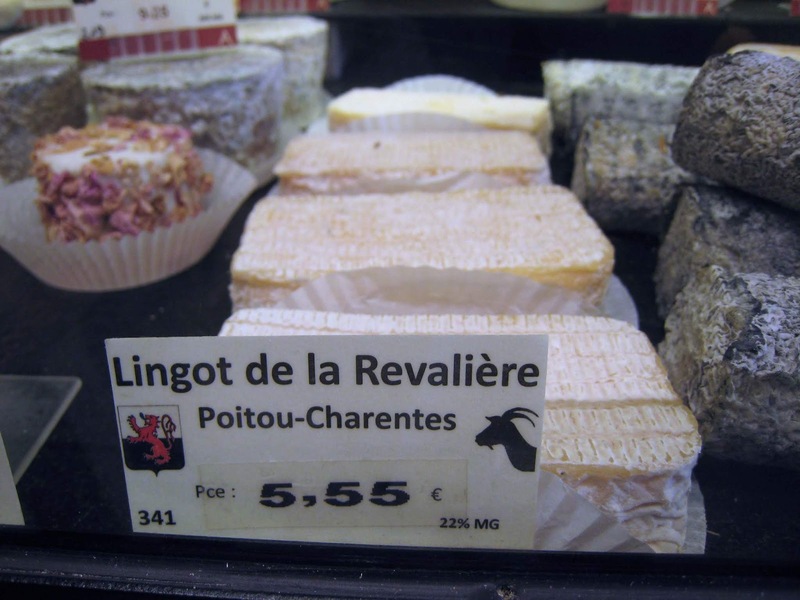 I very nearly published this post under the name Lingot de la Revalière, and when you see the case when I buy the cheese, you'll understand why. Since the website of the fromagerie itself calls it Lingot de Gâtine, however, I'm assuming that's the "real" name. They're the ones making it, so they get to name it. I'm supplying this alternate, probably incorrect, name simply because you may see it sold under this name, as I do. No matter what it's called, it's a treat of a cheese, with an absolutely thick, snowy-white interior, creamy but in a dry way. You can absolutely taste the sweetness of the cream coming through, along with herbal and floral notes from the plants where the goats graze. While Lingot de la Gâtine is technically made in the adjacent area of Poitou-Charente, it's just a stone's throw to the tiny Vendée town where I encounter this particular Roman megalithic stone. However, I would only try throwing a very small stone, not one the size that the Romans managed to move into place. In addition, this slab-shaped cheese looks very much like a smaller, more delicious, more dairy-ish version of the megalithic stone.